1. I would rather have a paci in there than a thumb. You can't take the thumb away and a thumb habit is harder to break. 2. If you have to give your child a pacifier, I recommend the Nuk style seen here rather than the hard straight round kind. 3. Don't worry too much if the child's teeth get that overbite look. Most of the teeth movements that occur in the front of the mouth tend to revert to normal after the habit is discontinued. Usually there is no long-term effect so long as the habit does not persist into the permanent dentition. Basically, get the paci or thumb out of there before age 5 or 6 years of age. You've got a little time to work on it. 4. If the child develops a posterior crossbite, well that's not going to correct even if the paci is gone. Your dentist will likely need to place a crossbite "expander" for a few months to correct that.--very common orthodontic correction. Most of the time I wait till the child is at least five, but I have even corrected a posterior crossbite in a three year old (albeit a remarkable three year old)! Sometimes you need to wait till the child is older (after the six year molars have erupted). Oh one more thing, don't dip the pacifier in honey or anything like that! 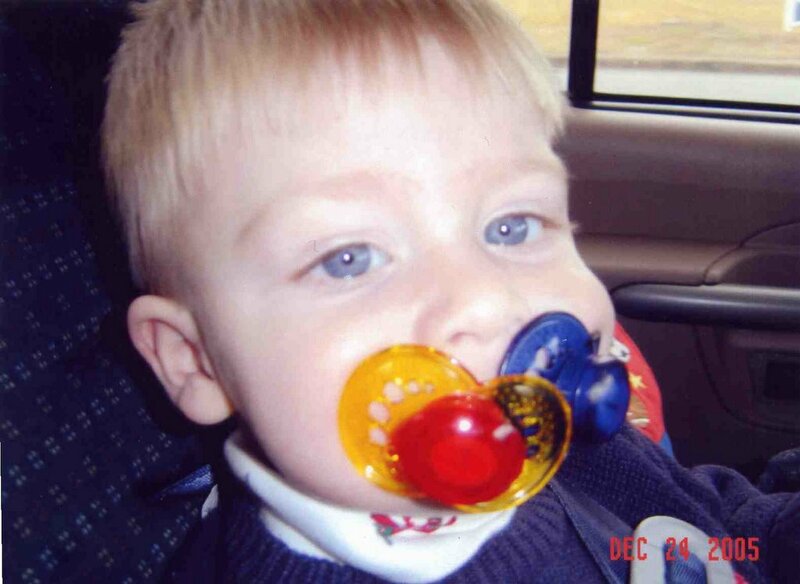 *Update as of March 2006-The child in the photo above has two paci's in his mouth (and one in his hand). His mother just reported to me that he has kicked the habit. No more paci! Thanks for posting this! I'm really just tired I guess of people who think they know everything! I think they may need to go to college to be a dentist or something! My daughter is 3 going on 4 Jan 2009...She adores her binky and likes it very much! I've tried all sorts of things and they dont seem to work! I take her to pediatric dentist ( a very good dentist by the way) who knows that she uses her binky, basically it's not a good thing but not the worst I guess either! I guess having it gone by age 5 or 6 after all isn't so bad! 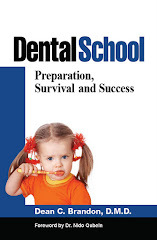 My family needs to read this and stay off my case, half of them dont even take their children to a dentist! So what's worse the BINKY or not seeing a dentist @ all? Thanks! My daughter is 3 years old. She drinks milk out of a bottle 2-3 times a day. She doesn't want to drink it out of a cup. Is this going to cause issues with her baby front teeth? I'm worried she won't drink milk if I tell her she can't drink it out of a bottle. She has never had a paci. I never introduced one to her bc I didn't want it to mess up her teeth and jaw. She isn't sucking on a bottle ALL day just uses it to drink her milk. Sleeping with a bottle (or other container and ad lib drinking in bed is a real concern. During the day, bottle or sippy cup does not matter. What matters is duration. It's worse if it is at night. 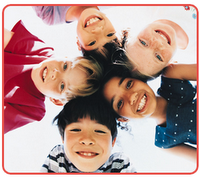 Milk, etc does not cause cavities, it may accelerate the progression. The ortho Gibby pacifier was designed by a pediatric dentist which is FREE OF BPA and PVC NO FDC coloring made in USA. Clinical studies show that conventional pacifiers significantly increase the risk of jaw deformities and ear infections. Children using conventional pacifiers have a 50% greater chance of developing an ear infection (Source: Family Practice, Advance Access, published June 17 2008. Hello, thank you so much for this information. My almost 3 year old daughter still uses a pacifier at naptime and bedtime. Her dentist told us last week that she has a posterior crossbite. He didn't really definitively say one way or another if the pacifer should be taken away. He did say it's probably not helping the situation, but that it probably wasn't the sole cause. He also agreed that it was better to use a pacifier than thumbsucking since it will be easier to break the habit. We have been talking with her about giving up the pacifier to get her ready, but honestly we were hoping let her keep her pacifier until she is done for good with naps. I am wondering what your suggestion would be on giving up the pacifier now or if we can wait? As you can read, it is difficult to get a two year who loves the paci to let it go "cold turkey." 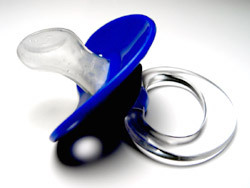 Most kids give up the paci by age three and a half. You can gently distract over time when the use is predictable--like when watching TV or sleepy, hang it on the tree at Christmas for Santa to take, or clip off the end bit by bit. Those things only work when the child id=s ready and there is no way to tell. Good luck, get her pediatric dentist to follow this over time. My son is only 11 months old and has crossed the anterior bite (upper teeth behind the lower). There is a pacifier that is special to treat this type of problem. Excuse my grammar in English. No special pacifier for this as far as I know. What should I do if my 1 and a half year old refuses to sleep without his pacifier? He has 4 upper and lower teeth. My daughter just gave up her paci, we took it away a month before her third birthday, for the past 6 months we had reduced it to nap/bedtime only. The first night was the hardest, the rest of the week she asked for her paci and we just had to tell her that she didn't have one anymore (we did take her to an amusement park, and other outings reminding her during them that big girls who don't need paci's get to do fun stuff like this). Our dentist also said having the paci was fine, my husband has been pushing hard for her to give it up despite there being no dental urgency. Ultimately it became a burden, always needing to know where one was, her waking us up in the middle of the night to find it (when it was in plain sight), and it becoming heavily engrained in our routine. I didn't want to wait any longer, we've had 3 moves and a new baby and I waited until our living situation was (temporarily) stable before taking it away. I think she's old enough where I can explain why she can't have it and have her understand that it's not a punishment, while not being old enough to argue about it. Good luck to everyone out there with as paci loving child, as a former smoker I was very sympathetic to her paci withdrawals. My child is 15 months. She has 4 upper teeth 2 lower. Her lower teeth are upfront of upper. It seems like she is shifting her lower arch forward. I can get it back to edge to edge but not cl 1. I've never given her a pacifier. She breast feeds only floor comfort at night. No direct history of class 3. Any suggestions? Suggestions? At this point, wait. Some kids just naturally position their brand new teeth in an underbite. Se where you are a year from now when there are more teeth. My daughter used the Mam style paci until 13 months old. I notice an underbite and the front two teeth are not straight with the others. however she still drinks (18 m) for a bottle 3 times a day. The rest of the day a sippy cup. will this need correction or may it naturally correct over time?